• Capsicum - 5 numbers. • Turmeric - 1 tea spoon. • Coriader powder - half tablespoon. • Coconut powerd - 1 tablespoon. When the onions are slightly cooked add pinch of Turmeric, ginger - garlic paste.When the onions are slightly sauted, add bell pepper (Do not cover it with a lid). And cook it for 3 to 4 minutes. This is a simple dish with Bell Pepper (Capsicum) goes well with pulka, Chapathi or even rice. Capsicum Masala Curry is a very popular and savory Andhra delicacy... Read More..
Capsicum Masala Curry is a very popular and savory Andhra delicacy Capsicum Sada Masala is a simple and delicious curry very easy to cook which can be served as a side dish for Chapathi, Paratha, Naan, Roti and rice. Capsicum by itself has a unique flavor and tastes great when mixed in different curries. It gives the curries a colorful look of savor. This dish is made with simple ingredients as capsicum being the main ingredients with onions chopped and fried nicely with spices tastes fantastic. Capsicum is a refreshing vegetable that comes in an exciting range of colors, like green, red and yellow. It is native to America and in fact, has been cultivated by the people of the tropical Americas since the past thousands of years. Known by a number of names, like chili pepper, bell pepper and red or green pepper, the vegetable is used as a spice, medicine and obviously, a vegetable. Apart from being good in taste, capsicum also holds a great degree of nutritional value and accords numerous health benefits to its users. Heat a tbsp of oil in a sauce pan. Add few mustard seeds, cumin seeds and fresh curry leaves allow them to crackle. Now, add chopped onions, and salt (which helps the onions to cook faster). When the onions are slightly cooked add pinch of Turmeric. Add ginger - garlic paste and sauté well till the raw flavors are gone. When the onions are slightly sautéed, add bell pepper (Do not cover it with a lid). When the Bell pepper is slightly cooked, add coriander powder, chilli powder according to your taste. Mix Well. You can be generous in adding cauliflower, potato, or green peas to this bell pepper which will enhance your dish even more. After 10 mins of slow cooking, the capsicum (bell pepper) looks great and your dish is ready. Garnish it with freshly chopped coriander (cilantro). The most common variety that we find in India is the green bell peppers, commonly known as Capsicum. They have a refreshing juicy flesh and crisp texture. And unlike mature bell peppers yellow and red, they do not have a sweet flesh. Chopped into narrow slices, this vegetable tastes great as pizza topping, can be cooked into curries and can be used as seasoning. This tangy vegetable is not only used for its medicinal properties, but the strong, spicy flavor is a great culinary ingredient. Capsicum as a vegetable is used combined with few vegetables like the potatoes, peas, cauliflower to make excellent tasty dishes. Capsicum enhances the taste of the dish with its unique flavor. They taste great when added to salads and salsas. The capsicum sada masala curry in a simple dish made with bell peppers and goes well with polkas, chapatti or even rice. Do make this recipe as the capsicum has enormous health and nutritious benefits and is a best diet for your whole family. 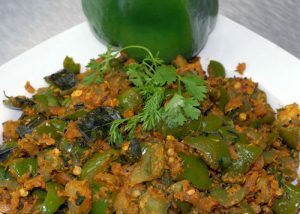 This following, traditional recipe from Andhra Pradesh, India suits green bell peppers and is quite easy to prepare, tastes good. The bell peppers are rich in nutritional value and are also associated with numerous health benefits. Capsicum is rich in beta carotene, capsaicin and vitamins A and C, which are good for preventing a host of diseases, including live disease and impotency. Capsicum is great for metabolism. The nutrients in these tangy vegetables lower triglycerides in the fat deposits in blood corpuscles. This not only burns extra calories, but also energizes the metabolism. I love this dude. He's so awesome and he makes me hungry every time i watch. Thanks,Chef! I will try this one tonight! hahahahahahahahhahahaa, watch his eyebrows when he takes a bite. looks good though. i made this dish yesterday for lunch and it was absolutely DELICIOUS!! i ate it with the pesarattu moong dal dosa. WOW, thank you, thank you chef. i have been watching your videos for over one year and they really inspire me! u shd add a ltl sugar and crushed peanut to it and ginger garlic paste as well !!! Another great video!!! Do you have to add the coconut powder? Also could you use curry powder instead of leaves?